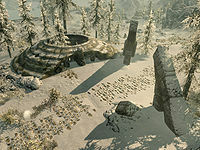 Windward Ruins is an open-domed Nordic ruin southwest of Dawnstar, inhabited by skeevers. It is one of the three ruins visited for the Destruction Ritual Spell quest. With the Vigil Enforcer Armor Set Creation installed, Azarain's corpse can be found here. There is a central circular area surrounded by an enclosed outer passage. It is guarded by two skeevers and contains an adept locked chest behind a tilted pillar by the outer wall of the passage. During Kyne's Sacred Trials quest you will find a larger-than-life, ghostly skeever within the ruin. In the central area is a plinth which you need to activate to place the book; Power of the Elements received from Faralda. Then cast a flame spell at it, in order to advance the quest and receive the next clue to the second location. There is a snowberry bush in the central area. Three leveled bandits have set up a camp 580 feet to the northwest, below a rock ledge. The only items of note in their camp are an unlocked treasure chest and a copy of the Destruction skill book A Hypothetical Treachery. Agrane Peryval's camp can be found north of Windward Ruins if you have the Saturalia Holiday Pack Creation installed. This page was last modified on 20 January 2019, at 20:06.